Loosely described as ‘surfing in the snow’, snowboarding is one of the most popular winter sports out there. It’s relatively easy to learn (though it’ll take you ages to get up there with the pros) and there’s a massive amount of kit out there to choose from. Boards come in a quite staggering range of sizes, shapes and colors and Rome is fast becoming something of an industry leader. They registered record sales last year and seem to be going for even better this year. Their boards are regular award winners, often to be found sitting at the cutting edge of new design features. Since they started making boards, they have made a point to get as much feedback from their customers as possible. The result of which is an ever-improving brand that delivers what the people want. Rome’s 2011 range includes some incredible boards with features guaranteed to earn you a responsive, smooth ride whilst cutting some seriously accurate turns. Well, you can’t argue that the Rome Agent Rocker Addictive Collection Snowboard certainly stands out from the crowd with its eye-catching graphics. One of the boards depicts Rome’s version of the Last Supper, with the faces of famous people who died in 2009 including Michael Jackson, Patrick Swayze, Les Paul and David Carradine amongst them. Now there’s a fantasy dinner party. Probably the most exciting feature of this new board is the placement of the rocker. It sits between your bindings to allow maximum glide whilst retaining the power of a regular camber board. It simply flies down mountainsides and cuts amazing corners, even at high speeds. The edge on this board is a little beefier than usual which gives some added protection against the beatings of parks and natural terrain. The QuickRip Sidecut Technology features a midsection sidecut that is joined to the nose and tail with transition zones. These create two contact points along the middle of the board which sit just outside of the binding mounting area. The result is a super-svelte ride. 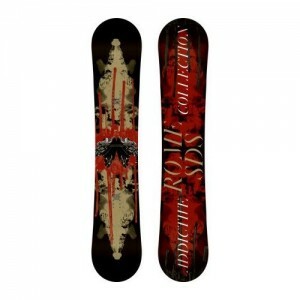 On the whole, the Rome Agent Rocker Addictive Collection Snowboard gets rave reviews and you’ll probably be very happy with your purchase. This is not a board for the faint-hearted and it simply demands to be thrown about with vim. On some accounts, the board is not so suitable for park riding, being a little too ‘stiff’. If you’re not used to rocker boards, you might find that the Rome Agent Rocker Addictive Collection Snowboard takes some getting used to. It rides even better once you learn to trust that it can handle pretty much whatever you decide to throw at it so once you’ve sized each other up properly, get ready to have some real fun with this fantastic board. This entry was posted in Reviews, Rome, Snowboarding, Snowboards and tagged Rome, Snowboard. Bookmark the permalink.